We all love an easy and quick pasta dish. This recipe uses staples of the pantry and fridge, which means it can be whipped up anytime. Perfect for the flat and family, as it is easy on the wallet. It cooks in 15 minutes or less (mise en place done and water boiling). It has neither cream nor milk. Only eggs and cheese to make it creamy and cheesy. It tastes so much better than store bought sauces that you would silently marvel at its simplicity and wonder why you didn’t know this years earlier. Well in my case, I wondered out loud. Better late than never, eat up! 1 cup grated cheese, mozzarella, Edam, anything you like really! Bring a large pot of water to the boil. Add a tablespoon of salt when the water starts to boil. In a large bowl, lightly whisk eggs, a tiny tiny pinch of salt and the grated cheese. Set aside. Add the pasta to the water and cook till it is nearly al dente (about 8 minutes). 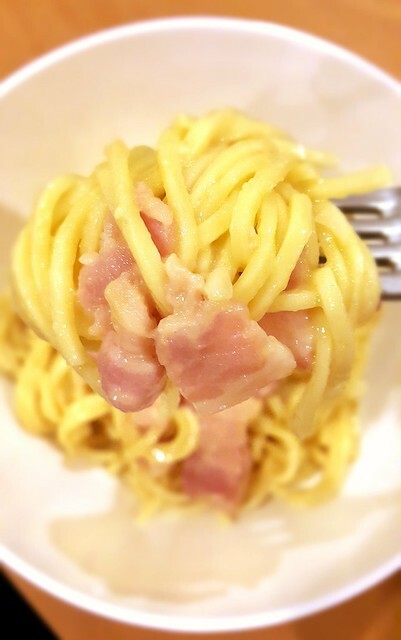 While the pasta is cooking, fry the diced prosciutto or bacon in a thick based pan until coloured. Add minced garlic and fry for another minute. The key point is to cook the pasta and meat simultaneously, and not letting the pasta over cook. Better let the meat wait for the pasta, than the pasta for the meat. Reserving most of the pasta water, remove the pasta from the pot and put it in the pan together with the meat and stir to combine. Add a cup of the pasta water to the pan. Take the pan off the heat and pour in a quarter of the cheese and egg mixture. I usually add that closer to the side of the pan closest to me. Working really quickly with tongs, I vigourously stir the cheese and egg mixture in with the pasta until the sauce is smooth and clings to the pasta. If done quick enough, the sauce will be silky and creamy, and shouldn’t be eggy nor lumpy. You may need to add more pasta water – make sure this is added to the opposite side of the pan where you add the cheese and egg mixture. Repeat step 7 until all the cheese and egg has been added. It might take you several times to master the speed and action to achieve the perfect silky sauce. I promise you once you’ve got it, you (and your family) will be very glad you’ve mastered this recipe.